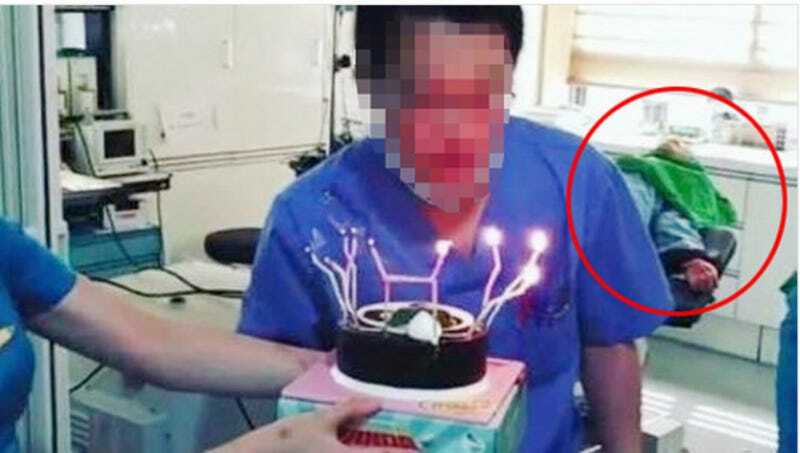 A South Korean plastic surgery clinic is under investigation after Instagram photos showed clinic staff eating birthday cake and burgers in the operating room, with an unconscious patient on the table behind them. Because the best parties are the incredibly unsanitary ones. Agence-France Presse reports that Jewelry Plastic Surgery Center in Seoul's trendy Gangnam neighborhood is under investigation for the photos, which were posted by a staff member but later taken down. Alongside the food photos were others reportedly showing a staff member posing with a breast implant on her chest, and in all the photos, the staff are reportedly wearing scrubs with surgical masks dangling from their necks. Beside the fact that operating rooms are a really bad place to eat cake—So cold! No extra forks!—taking party photos in this setting might violate South Korea's laws against "immoral conduct," meaning anything that could tarnish the image of medical professionals in the country. A public health department spokesperson told AFP, "Our officials are investigating the clinic to see if there was any violation of medical laws. They may look into whether such behaviour damaged the reputation of medical practitioners." South Korea has the highest per capita rate of plastic surgery in the world, and things occasionally get a touch weird: another clinic in the Gangnam neighborhood was fined earlier this year for building two artful towers made out of the jawbones they'd removed from patients hoping to slim their faces. Playing Jenga with medical waste, like eating birthday cake next to an anesthetized gentleman, is illegal. AFP reports that Jewelry Plastic Surgery has apologized for the "careless actions" of its staff, adding, "We are left devastated for causing such concerns among our clients… because of the senseless behavior."